Thank you for visiting our web site. Our intention in creating this site is to provide information to our community about the Medicare hospice benefit and other palliative care benefits that may be available. The site is structured to provide information to the various audiences that we work with on a day to day basis. Those audiences are: our patients and their families, area health care professionals, health care career seekers as well as other community organizations. Of all the benefits available to our seniors we believe the hospice benefit is the most misunderstood of them all. The benefits are incredible, the cost is negligible and yet the participation rate is low. We believe this is because of a fundamental misunderstanding of the program. If you have questions about hospice care or if you are in need of health care services please free to contact any of our staff or submit a question online. 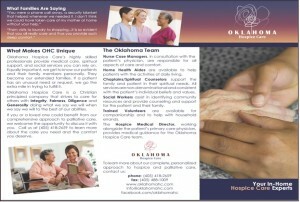 Who is Oklahoma Palliative & Hospice Care? Oklahoma Palliative & Hospice Care is one of the oldest hospice providers in the State of Oklahoma with its approval to provide Medicare hospice services originating in 2004 and supporting counties throughout the Oklahoma City area – see all approved servicing counties. Oklahoma Palliative & Hospice Care is a community based hospice care organization dedicated to hospice care and focused on meeting or exceeding our patients’ individual medical, emotional and spiritual needs, while making each remaining moment as meaningful as possible. While Medicare mandates the minimum services that hospice patients must receive, at Oklahoma Palliative & Hospice Care, we are committed to exceeding industry standards because we recognize that each patient’s life experiences and spiritual beliefs have created a unique individual who deserves the finest care and emotional support, while honoring and respecting their needs and wishes. 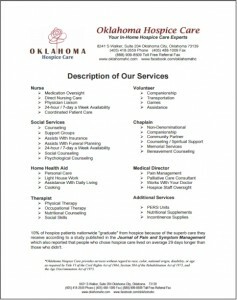 What Makes Oklahoma Palliative & Hospice Care Unique? There is a big difference in hospice service providers. We understand the issues seniors, physicians and families face and have developed programs to address them. Seniors want to remain in their homes as long as they can. Seniors lack affordable health care providers that are willing to come into the homes. Seniors plans of care are often too complex to successfully follow on their own. Physicians have less time to spend with seniors in their office because of visit time constraints. Plus seniors often see multiple physicians leading to uncoordinated and conflicting plans. Seniors don’t want to burden their family or lose their dignity at the end of their life. Physicians have less time to visit each patient because of lower reimbursement rates. Physicians are used to delivering care in their offices during a patient visit. Many of these seniors are not capable of being seen in their offices and even if they are seen in the office the physician is unable to assess the living conditions the patient is dealing with. Physicians are unable to collaborate with specialist that their patients are seeing to the extent that is needed. 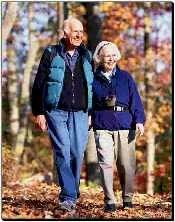 Physicians tell us that nearly all of the seniors under their care fail to accurately and routinely follow their plans of care including taking of medications at the right time in the right quantities, eating right, using equipment properly, and cleaning themselves and their surroundings properly. Physician patient referrals can be made from this site to save time. Families have increasingly busy schedules with many having both parents working outside the home trying to earn a living. Families stress levels increase while taking care of parents which can lead to health problems for them or can lead to relationship issues in the home. Families have a lack of knowledge of the programs that are available to assist in the care of their seniors. Families are often ill equipped to deal with complex plans of care. 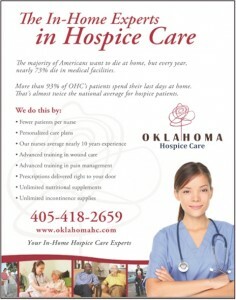 Oklahoma Palliative & Hospice Care employees are experts in taking care of seniors in the home. Most hospice service providers prefer to take care of hospice patients in facilities such as assisted living facilities, nursing homes, hospitals or in-patient facilities. The majority of Americans want to pass at home, but every year, nearly 73% pass in medical facilities. More than 93% of Oklahoma Hospice Care patients spend their last days at home. That is nearly twice the national average for hospice patients. 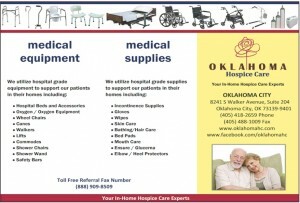 Oklahoma Palliative & Hospice Care provides most equipment and supplies related to the hospice diagnosis at no charge. Equipment and supplies are expensive so many patients are unable to afford these much needed services. To learn more about Oklahoma Palliative & Hospice Care please review our company brochure (below) or contact any of our staff or submit a question online. Call us today to learn the many benefits of the Medicare Hospice Benefit and the difference in care you will receive with Oklahoma Palliative & Hospice Care! Also would you consider donating to Oklahoma Palliative & Hospice Care? Many families are in need of help but they are without insurance. We take as many as we can but this is impossible without your help. *Services provided must be related to the terminal diagnosis. **Oklahoma Palliative & Hospice Care provides services without regard to race, color, national origin, disability, or age as required by Title VI of the Civil Rights Act of 1964, Section 504 of the Rehabilitation Act of 1973, and the Age Discrimination Act of 1975.